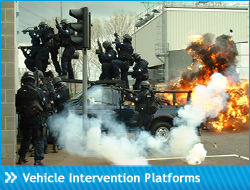 FDS vehicle platforms are in use with Police and Special Forces worldwide. They enable rapid entry and increase operational capability for tasks such as hostage rescue, counter narcotics, law enforcement and counter terrorist activities. A variety of off the shelf products are available for a range of vehicles, or custom built systems can be developed to the customers requirement. FDS manufacture over 100 variations of ladders up to 7m in length. Available in single width, double width and triple stile heavy duty rating to cover a wide variety of operational scenarios. All FDS ladders are CE marked and are field proven in the toughest environments. 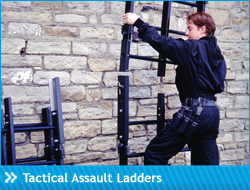 Specialty equipment includes marine boarding and window breaker ladders. 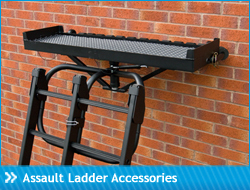 A range of accessories are available to complement the FDS ladder range and increase operational capability. These include cushion rests, foot platforms and aircraft gantry's. 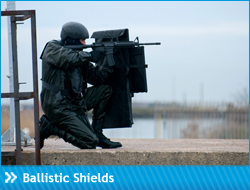 FDS ballistic shield range began with C-BASS, an innovative folding shield that is lightweight and bouyant, offering today's operator new capability in demanding environments. Due to the versatility and ergonomics of the shields, they are ideal for use on FDS vehicle platforms or ladders and can be manoeuvred through confined spaces. 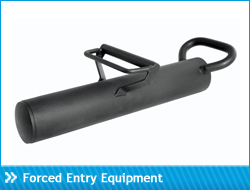 FDS offer a range of breaching tools to complement the range of tactical entry equipment. These include bolt cutters, door breaching tools and tactical rams. FDS provide a full range of training and support packages with all equipment supplied to customers worldwide. Covering training, installation, servicing and operator handbooks, there are a range of packages that can be tailored to your individual requirements.